What's the "missing man" formation? What’s the “Missing Man” Formation? Your basic fingertip strong right, with a twist. On Wednesday, veterans commemorated the attack on Pearl Harbor with a ceremony that included a 21-gun salute. Around the time of day when the attack occurred 64 years ago, a group of fighter jets flew by in the “missing man” formation. (Earlier in the week, a fleet of helicopters performed a similar tribute over a New York City memorial for a murdered policeman.) What’s the missing man formation? A classic aircraft maneuver used to honor the dead or missing. The simplest type of missing man formation consists of four aircraft that begin in what’s known as the “fingertip strong right” formation. That means they’re in the shape of a V, with the right arm—from the pilots’ perspective—longer than the left. Think of the relative positions of your fingertips when you look at the back of your right hand; the leader (or middle finger) has two planes (the ring finger and pinkie) trailing off his right wing and one (the pointer) off his left. As the V passes overhead, the plane in the ring-finger position peels away into the sunset, sometimes trailing a cloud of smoke. 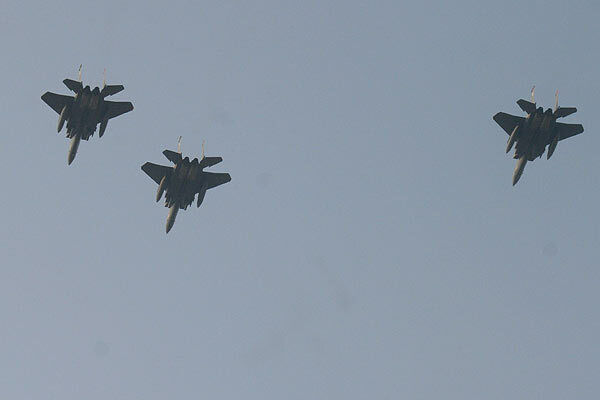 The missing man formation can also be performed with three planes, with the ring-finger position left vacant. Or it can include far more than four planes. Fifty fighters in three formations flew over the memorial for JFK—the last group had one spot missing. As a general rule, only pilots or military personnel get the missing man tribute. The Challenger and Columbia shuttle disasters, for example, merited high-profile missing man formations. In some cases, the formation flies over civilian funerals as well. The Texas A&M football fans who died constructing a bonfire in 1999 received the posthumous honor before an Aggies game. (Former Dallas Cowboys coach Tom Landry also got the missing man formation; he’d been a pilot in World War II.) Anyone can order up a missing man tribute if they’re willing to lay out some cash. It will cost you anywhere from a few hundred bucks to more than 10,000, depending on the type of planes used and the distance they have to travel. Other classic formations include the “echelon,” in which all the planes are arranged in a diagonal line—like a V with only one arm. There’s also the self-explanatory “diamond.” Starting in World War I, military fighters began using formations to stay together in low-visibility conditions and as a means to provide combat support. Over the years, tight formations were also used to escape radar detection. Air Force pilots still use the fingertip and echelon formations during some missions; only stunt pilots use the diamond (or the double-diamond). Flying in close formation can be very difficult. Formation pilots say it takes 50 hours of practice to become a competent wingman and another few years of practice to become a leader. In general, pilots have a tough time staying in a tight fingertip for more than 15 minutes at a time. They can maintain a “route formation,” in which each plane has substantially more room, for hours. Explainer thanks Mike Stewart of Team RV.